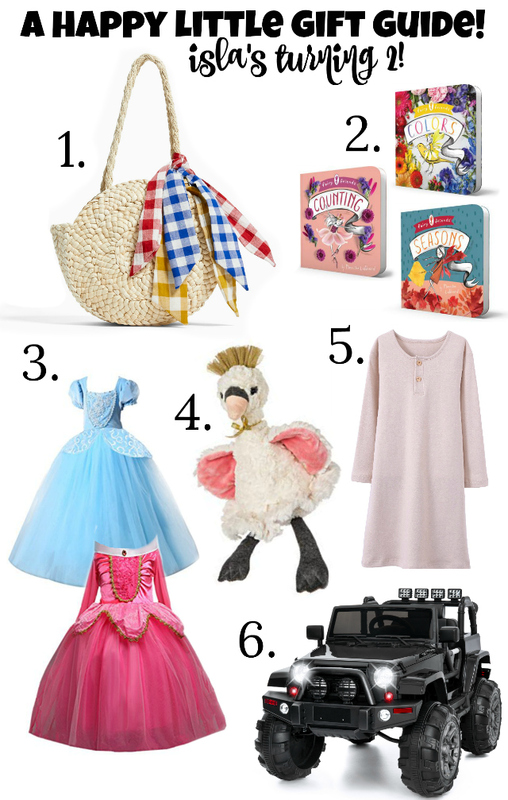 Sugar Hill: a happy little gift guide: isla's turning TWO! a happy little gift guide: isla's turning TWO! Isla turns two this week & I’m so excited to celebrate her again! She obviously has no requests or needs as far as gifts go, but it’s always so fun to put together these little gift guides. 1. This straw bag is the very cutest. She’s always stealing all of my bags and dragging them around the house, so I think she’d enjoy one that looked like mine but was all her own. 2. These fairy friends books have the prettiest illustrations and are by far some of the better primer books out there. We read every night with the kids and books are my favorite thing to buy for them. I like the simplicity of these. We have the "Opposites" one and the kids ended up memorizing it & “read” it all on their own. 3. Dress up is one of our kids favorite things to do. They will always choose activity or imagination over any toy, and our costume box definitely needs updating! The girls love alllll princess dresses, and all three of them love to play super hero’s or pirates or wizards at Hogwarts! 4. How sweet is this swan?! 5. Both of the girls refuse pants most of the time and even at night they’ll choose a nightgown over a set these days. This one looks simple and pretty, and these are really fun too! 6. This year might finally be the year we are going to get the ride on jeep. We’ve talked about one for a couple years now, almost got lucy one, almost got it for abel, and in the end had parties for them instead, because I really just love a good gathering & any reason to celebrate, decorate or eat!